Seth Godin, Why bother having a resume? It appears LinkedIn has taken this advice to heart. LinkedIn already has recommendations. Now LinkedIn has opened up its site to let third parties build apps for users. There are nine apps to start with. There are two apps letting you add documents to your profile, which touches on Seth’s “projects” advice above. And two of those apps allow you to add your blog to your profile: WordPress and SixApart. Which is interesting…two blog apps in the initial nine? What’s that telling you? Out in the wild, there are millions and millions of blogs. The smart advice for bloggers is to stick with it, seek out others and engage in conversations. That’s something that should regularly be part of the blogging life. You’ll learn a lot. But, it’d be nice to know your professionally oriented blog was reaching others who might open career paths. 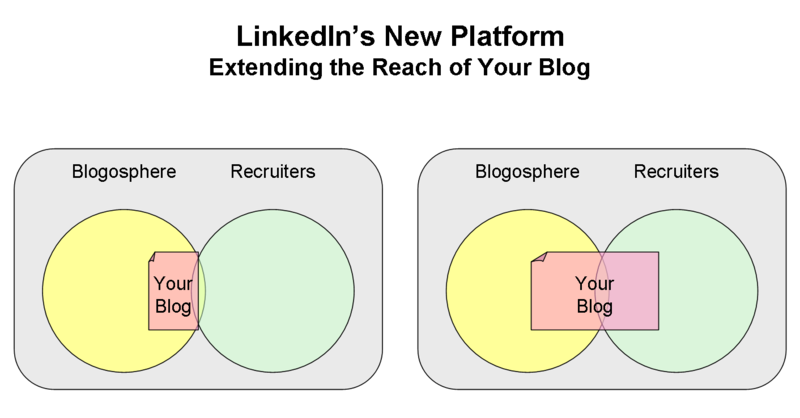 Which is why LinkedIn’s move to add blogs is so exciting. I know the long-term trends favor recruiting via the blogosphere. But for the next few years, I’m not expecting recruiters to get out there and find candidates based on their blogs. They’ll still go to places where there are concentrated areas of people with relevant experience. LinkedIn has become one of those go-to places. That being said, recruiters, or more likely, the clients for which they are recruiting, can see a much better picture of you outside of the list of jobs you’ve had. This adds a new dimension to the reasons for you to blog. Bloggers can get caught up in things like traffic, frequency of posts, comments and making sure their blogs are part of the big social media sites. It’s just human nature. But now, your blog becomes something more. It becomes a record for how you think, what topics are your passion and opinions on events affecting your field. Even if no one reads your blog out in the blogosphere, you’re still making a case for your talents. And there’s no need to have a high frequency. Whatever you last posted shows on your profile, whenever that was. A friend recently asked me about blogging. She’s in the non-profit world now, and wants to transition to the business world. I told her one thing blogging can do is get you out of the box that your past work experience and education put you in. Through blogging, you can demonstrate the aptitude to handle work in a new field. Hats off to LinkedIn for adding these apps. Great addition, and something more people should take advantage of. I tend to agree with this … at least with the comment that recruiters are more aware of blogs as a resumé tool. I was asked the other night for my business card so my contact from an international airline could read my blog. He had no idea I kept one, just assumed so. My blog thus becomes a vital introduction to me and to my work. Kate – that’s really cool. The guy figured (a) you blog; (b) it’d be on your resume. Love it. LinkedIn has added an application that will import and add your latest WordPress posts to your LinkedIn profile. Check the Applications tab when you log into LinkedIn. Oops… hit the enter button too soon! I’m hoping that the LinkedIn WordPress app will give my blog some more exposure within my LinkedIn network. I do get readers through referrals from other readers. Oh I personally love WP and LinkedIn. So, when these two platforms joined forces to produce an app, I adored them more! My work on WP that’s now showing on my LinkedIn is an added credential points to me.